Our range of products include commercial dehumidifiers. 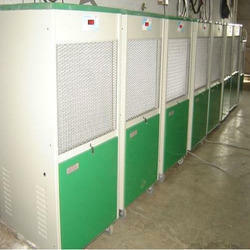 We are leading manufacturer and exporter of Commercial Dehumidifiers and our product is made up of good quality. Aesthetics with silent operation, Commercial Dehumidifiers is easy to use with a top-mounted control panel and variable environmental settings. It has an attractive design and numerous safety features including the DUEX® System with alert light that automatically shuts off the machine if it detects that the water tank is full improperly positioned, or missing. The DUEX® system is only used when you have not opted to connect the hose to continually drain the dehumidifier. Looking for Commercial Dehumidifiers ?